Style #869 is a mini-round tipped cotton swab that is single tipped, and attached to a 6" x 1/12" applicator stick made of hard white birchwood. 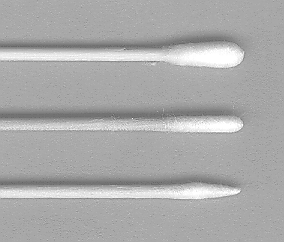 The cotton tip is rounded and approx. 1/8" in diameter. Style #869 is packaged in single packs that contains 100 swabs, one box contains 1,000 swabs and a case contains 10 boxes or 10,000 swabs total.